Old Town Alexandria is a Metro-accessible getaway to avoid traffic in the District Inauguration Day. This weekend, D.C. will be filled with tourists clogging up every neighborhood from Adams Morgan to Georgetown and everywhere in between. If this seems like a nightmare to you, there are plenty of places just outside the District that are perfect for a quick getaway. Hop in a Zipcar or on the Metro and take off to one of these weekend escapes. A little more than an hour away by car and filled with historic charm, Harpers Ferry is the perfect place to avoid D.C. for the day. Downtown Harpers Ferry has beautiful old homes and traditional restaurants and shops, including the Potomac Grille, which serves classic American cuisine and scenic views of the Potomac River. There are also a number of shops in the town, like True Treats Historic Candy, where you can sample candy from the 1700s. They also offer modern candy if you’re not feeling adventurous. The Appalachian Trail runs right through the center of town, as well as through Harper’s Ferry National Park. The park showcases scenic views of the Shenandoah and Potomac River valleys, with 20 miles of trails running through Civil War battlefields and to the tops of mountains. If you want an escape from the concrete jungle of D.C., Great Falls Park in Virginia – only a 30 minute drive from D.C. – is the perfect destination. Take a quick 10-minute walk from the visitor’s center, and you’ll be blown away by the breathtaking views of three waterfalls on the Potomac River. You can also walk the trails along the river for a view of the Potomac without the Washington Monument rising in the background. If you’re up for more of an adventure, the state park also has 15 miles of hiking trails to explore on foot or bike. 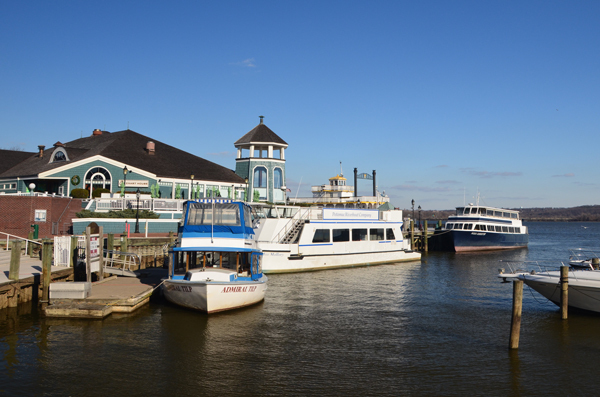 A charming town close to D.C., Alexandria offers plenty of attractions to keep you busy all day. It’s about a 30-minute ride on the blue line, so you don’t have to travel far to experience this picturesque town. Plenty of shops line historic King Street and its side streets, such as Mint Condition, which sells designer consignment clothes. La Madeleine Country French Café offers tasty baguette sandwiches, as well as sweet pastries that rivals Paul’s. Art connoisseurs will be enchanted by the Torpedo Factory Art Center – an old torpedo factory that has been converted into art galleries and studios. You can watch more than 160 artists at work on any given day and tour six galleries.